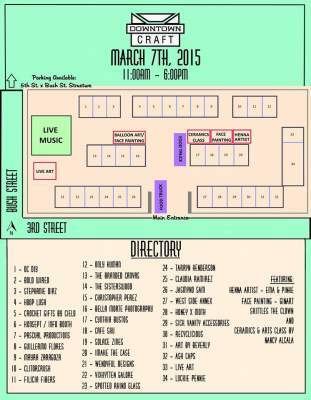 DOWNTOWN CRAFT on March 7th, 2015 from 11:00 AM – 6:00 PM. 40+ Vendors // LIVE MUSIC // LIVE ART. 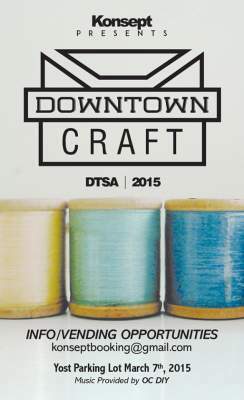 Downtown Craft – A craft festival for up-and-coming artisans local to Santa Ana & Orange County. We want to focus on the local talent of our community to help our artists thrive. 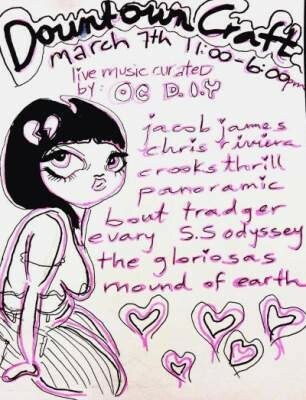 A percentage of the proceeds & donations will go towards Arts Orange County. Ninjas With Appetite will be arriving shortly pass 3 pm, so make sure you come by and pick up some of their food! Nancy Alcala will be conducting a ceramics demonstration from 12-5 pm. Need a ride to the event? Download the Sidecar app and use the coupon code “USA” to get $10 off your first ride. Enter the code in the Account tab, then request a ride and your driver will pick you up in minutes! Konsept will be at the DTSA Farmers’ Market today, 4-8pm! Visit us for mini posters (some people call them “flyers”) for Downtown Craft.